The present box belongs to a group of 'theme' boxes that were produced in the Qianlong period inscribed with characters summarising the principal carved scene on the upper-surfaces. Four examples were included in the exhibition, Chinese Lacquer in the Palace Museum Collection, Taiwan, 1981, nos. 41-43 and 68. A rectangular named box in the Nanjing Museum is illustrated in Zhongguo Qiqi Quanji, vol. 6, Qing, 1993, no. 225. Among this group, the present box appears to be unique in its construction of four tiers. It has also been noted that this unusual depiction of the cloud scirls first appeared in the mid-Qing period, and the clenched claws of the dragons are distinct from those of the standard out-spread claws; see 2000 Years of Chinese Lacquer, Oriental Ceramic Society of Hong Kong and the Chinese University of Hong Kong, 1993, p. 148. 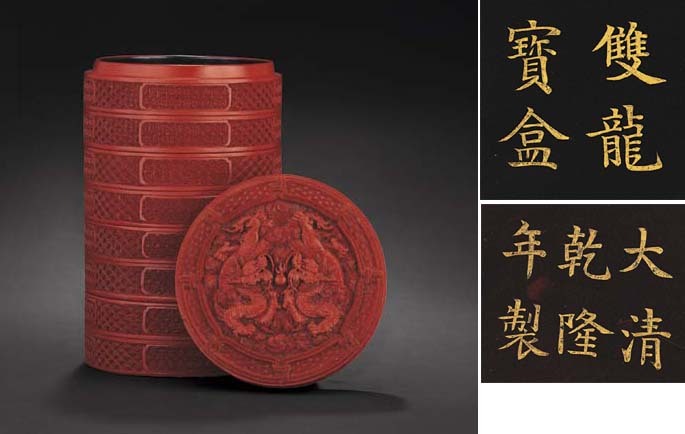 Compare with a related four-tiered 'ingot'-shaped box of the Qianlong period, executed in polychrome lacquer, sold in these Rooms, 26 April 2004, lot 925; and a three-tiered example illustrated op. cit., Taiwan, 1981, no. 57.